With 2011 coming to an end, I thought I’d go back and do a quick review of the top 5 most popular blog postings from 2011. It is not surprising this was the #1 read blog posting in 2011. I just made the switch from a Blackberry to an iPhone two weeks ago, and I can see why people love all the apps. There is an app for just about everything, and being able to access and act on your enterprise business content is no exception. My old Blackberry was great for email, calendaring, and browsing the Web, but the apps is where businesses are going to benefit. In August 2011, EMC released Documenutm Mobile for the Apple iPad extending the power of enterprise content management to the Apple iPad enabling users to act on information faster than ever. 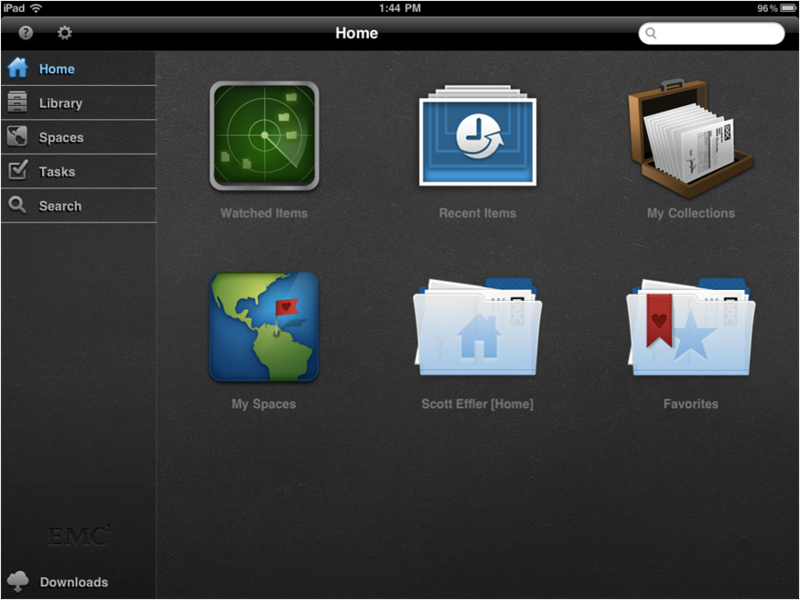 EMC Documentum Mobile is now available in the Apple App Store, and users of Documentum can take advantage of it today. I finished up reading the “The 4-Hour Workweek”, authored by Timothy Ferriss. I don’t read too many of these self improvement type books, but I found this one to be interesting. First off, the title is a bit of a misnomer, and you are likely not going to find that 4-hour workweek after reading the book. Second, at the back of the book it says “Warning: Do Not Read This Book Unless You Want to Quite Your Job”. Okay, don’t worry you can read it and not have to quit your job. I found some of the information in the book useful and parts of it rather obvious recommendations or bold claims of “get rich quick”. But most intelligent people will be able to read between the lines and pick out the useful information. What I liked about the book is Timothy Ferriss talks about how to streamline your business, eliminate distractions (e.g. email), automate your day to day processes, with the outcome hopefully being that you generate more revenue, but spend much less time doing it. Some rather straight forward tips that are at least worth trying out. He also talks about taking a “mini-retirement”, a different approach than the typical work to live approach. This advice is probably more practical for someone who has a self sustaining business than someone who’s employed by another employer. But it does make you wonder why we work to live, save, and eventually retire. Why not work, save, take a mini-retirement, come back to work, save some more, and then retire? My favorite quote from the book is “Being efficient without regard to effectiveness is the default mode of the universe”. This quote definitely rings true in some cases. Taking the time to step back and evaluate the effectiveness of what we are doing, may actually result in doing less while being more effective. In the end, what Timothy Ferriss is suggesting we create a life that balances work and play. This is not a new concept, but his recommendations put a different spin on this topic, and are worth trying out. This book is a very easy read and worth picking up. Enjoy the book if you choose to read. With a new administration in place, a lot has been said and written about computerizing our medical records over the next several years , and to help make this a reality the administration is considering delivering some funding. Most experts agree that digitizing much of the medical information that is currently maintained on paper will reduce costs and improve patient care. But simply dropping a computer and a scanner on every physician and administrative staff desk just won’t cut it. Doctors need to reap the benefits of technology without imposing an undue burden and taking time away from their main responsibilities of providing medical care. Administrative personnel need to be as efficient as possible, and require a solution that can be operated with a few button clicks, allowing them to get their job done quickly. With that said, a key piece to digitizing information and more effectively managing paper based processes is to use document capture. Capture solutions not only convert paper into electronic format but can automate most if not all aspects of the capture process including classifying what type of document it is, reading the data off a form, validating the information, and finally delivering it into a content repository and other medical systems. Those elements are important because it saves time and money during the capture step and makes people more effective at their job. Without an “intelligent” capture solution, users are often left to manually classifying documents, keying data, and hoping they did not accidentally make a mistake along the way. Another key element to capture in our hospitals and physician offices is the concept of distributed capture. Hospitals and medical groups are often distributed among many buildings and locations. Therefore the need to provide capture at the point of entry is critical so that the information can be processed and delivered into the appropriate systems in near real time making it instantly available to others who can then utilize that information to make informed decisions. So where can you use this technology? Many medical departments can use capture, including physician practices, inpatient, observation, emergency, ambulatory services, urgent care services, and more. Forms and processes could include automating the capture of patient registration forms, medical history, encounter forms, insurance cards, release forms, and more. It all sounds good, so is there anything we need to be concerned about? Well patient privacy certainly is a concern for consumer groups. There is fear that without adequate safeguards medical information could be misused or inadvertently released. The fears are valid but with proper planning, the right software solutions to manage and secure the content, well documented procedures and processes, we can overcome those fears. There will always be those privacy concerns, but there can be an appropriate balance between protecting privacy and being able to deliver high quality care in the most efficient manner. Change is good especially when it reduces costs and makes things more efficient. Look I’m blogging! Okay, I have to admit I never thought I’d feel the need to blog. After 15+ years experience in the software industry, I hope to share my insights about technology and business with partners, customers, co-workers, or whomever finds an interest in what I post. With that said…let the blogging begin! !